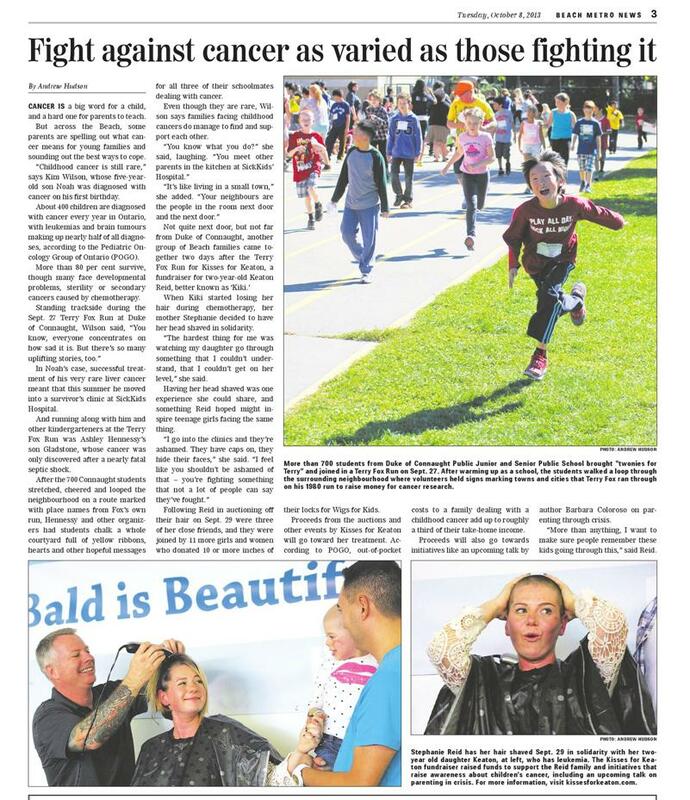 Excerpt from the Beach Metro News — Beach parents speak out about childhood cancer— October 8, 2013. Cancer is a big word for a child, and a hard one for parents to teach. But across the Beach, some parents are spelling out what cancer means for young families and sounding out the best ways to cope. “Childhood cancer is still rare,” says Kim Wilson, whose five-year-old son Noah was diagnosed with cancer on his first birthday. About 400 children are diagnosed with cancer every year in Ontario, with leukaemia and brain tumours making up nearly half of all diagnoses, according to the Pediatric Oncology Group of Ontario (POGO). More than 80 per cent survive, though many face developmental problems, sterility or secondary cancers caused by chemotherapy. In Noah’s case, successful treatment of his very rare liver cancer meant that this summer he moved into a survivor’s clinic at SickKids Hospital. And running along with him and other kindergarteners at the Terry Fox Run was Ashley Hennessy’s son Gladstone, whose cancer was only discovered after a nearly fatal septic shock. After the 700 Connaught students stretched, cheered and looped the neighbourhood on a route marked with place names from Fox’s own run, Hennessy and other organizers had students chalk a whole courtyard full of yellow ribbons, hearts and other hopeful messages for all three of their schoolmates dealing with cancer. Even though they are rare, Wilson says families facing childhood cancers do manage to find and support each other. This entry was posted in Duke of Connaught Public School on October 22, 2013 by The Ashbridge's neighbourhood. Before it was Monarch Park, it was Ashbridge’s Woods, at the north end of the Ashbridge Estate which extended from Ashbridge’s Bay to Danforth Avenue. This Saturday, October 19 I will be co-hosting a Tree Tour of Monarch Park with Jessica Piskorowski from LEAF (Local Enhancement and Appreciation of Forests). I hope you’ll join neighbours and nature lovers to explore the urban canopy. This year 64 new trees have been planted in Monarch Park, which puts us over the top for our goal of 1000 new trees planted in Ward 30 since 2010! I’m excited to continue strengthening our urban forest – let’s keep up the great work. The new trees in Monarch Park need care to help them thrive, and Friends of Monarch Park will be coordinating an adopt-a-tree program to protect our newly planted trees as they take root. What: Monarch Park Tree Tour. Where: Monarch Park – Meet at the North East corner of the park by the large rocks. When: Saturday, October 19, 2013, 11:30 a.m – 1:00 p.m. (rain or shine). This entry was posted in Monarch Park on October 17, 2013 by The Ashbridge's neighbourhood. There are only 30 TDSB students moving on to the Cross Country Conference Final on Monday October 21 at Ashbridge’s Bay. Out of the total of 30, Duke of Connaught is very well represented, with six of those students! Four girls and two boys. The runners are in Grades 6 to 8. This entry was posted in Ashbridge's Bay, Beach / Beaches, Duke of Connaught Public School on October 16, 2013 by The Ashbridge's neighbourhood. The magnificent maple tree which, in 1867, inspired Alexander Muir to write “The Maple Leaf Forever”, fell victim to an epic summer storm in July of this year. But did you know it will be getting a second life? Find out how the wood will be used to honor the cultural significance of this historic tree. Explore other trees in the neighbourhood and learn how you can salvage wood from your own trees to make beautiful furniture, bowls, and your own family heirlooms. Registration is required. For more information and registration, visit http://www.yourleaf.org. $5 suggested donation. This entry was posted in Event on October 16, 2013 by The Ashbridge's neighbourhood. Thanks to everyone who has visited the Ashbridge’s Neighbourhood blog. The number of views has just passed 10,000 — since the launch in May 2011. When I started the blog I thought I’d do it for a while to gauge the interest. There are now 600 views per month. This entry was posted in Uncategorized on October 15, 2013 by The Ashbridge's neighbourhood. Please join the Youth of our Community as they Remember Rameez Khadid at a Memorial today at SH Armstrong CRC, 4:00 – 8:00 P.M.
Food and stories to remember Rameez who was taken too soon but will never be forgotten. See more, including a photo of Rameez, on Applegrove’s Facebook page. This entry was posted in Applegrove Community Complex, S.H. Armstrong Community Recreation Centre on October 11, 2013 by The Ashbridge's neighbourhood. S.H. Armstrong has a lot of possibilities. Click on the flyers below to see the details on programs, fitness classes, preschool programs, renting Maple Cottage, birthday parties, Saturday tea parties for families etc. Also see the S.H. Armstrong online listings for swimming lessons and recreation swim times (click on Drop-in programs, then Swimming to see the rec. swim schedule). This entry was posted in S.H. Armstrong Community Recreation Centre on October 7, 2013 by The Ashbridge's neighbourhood.